The 2000 United States presidential election in Texas took place on November 7, 2000, and was part of the 2000 United States presidential election. Voters chose 32 representatives, or electors to the Electoral College, who voted for president and vice president. Texas was won by the Republican Party candidate, the state's incumbent governor, George W. Bush, by a 21.32% margin of victory. The 2000 election in Texas was a very partisan election, with nearly 60% of voters voting for the Republican Party candidate. The third party vote shrunk to a total of 2.7%, likely because Ross Perot was not on the ballot that year. The vast majority of counties voted heavily for Governor Bush as his approval rating and popularity in the state was high. Many of the long time rural Democratic counties, including those in East Texas along the border of Louisiana, swung Republican as the national party moved further to the left. Texas Democrats are more moderate to conservative by national standards, and many had a favorable view towards Bush because of his bipartisan approach with the Democratic state legislature during his tenure as governor. Bush carried 230 of Texas's 254 counties. He racked up big margins in the Texas Panhandle, East Texas, the Permian Basin, the Texas Hill Country, and the Gulf Coast. He won every major and mid-sized city with the exceptions of El Paso, Laredo, Brownsville, McAllen, and Beaumont, all of which were carried by Vice President Al Gore. Two thinly populated counties, Glasscock and Ochiltree, gave Bush over 90% of the vote, with the former being the strongest Republican voting county in 2000. This marked the first time since the 1956 election that a Republican candidate won any of Texas's counties with over 90% of the vote, and the first time since Texas native Lyndon B. Johnson any candidate has done so. 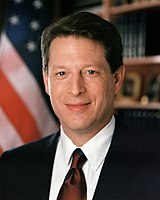 Vice President Al Gore, the Democratic Party candidate, performed strongly in South Texas, which is composed of a heavy Latino population, and the city of El Paso. Three counties in East Texas voted for Gore by narrow margins: Jefferson, Morris, and Newton. This was the worst performance for a Democrat in East Texas since the 1984 election. The Green Party candidate Ralph Nader, had his best performance in Travis County, home to the state capital Austin, winning 10.37% of the vote. As of the 2016 presidential election[update], this is the last time a Republican won this liberal Democratic-leaning county. This is also the last time Robertson County, and the East Texas counties of Newton and Morris voted Democrat, leaving Jefferson; home of Beaumont and Port Arthur, as the sole Democratic stronghold in this region until Donald Trump won it in 2016. This page was last edited on 18 December 2018, at 00:08 (UTC).